For decades astronomers have been searching for a world like our own outside the solar system that could host alien life. And now astronomers have announced that they have found one – a planet 1.1 times the size of Earth orbiting a star just 490 light years away. Called Kepler-186f, the planet is the first to be discovered with the right conditions for liquid water to exist on its surface, meaning it could support alien life as well. The find was made by a team of astronomers led by Elisa Quintana of the SETI Institute at Nasa Ames Research Center, who pored through planetary data from Nasa’s Kepler space telescope. To date, the telescope has found hundreds of planets, but most are uninhabitable worlds that are either too large or orbit too close to their host star to support life. The discovery of Kepler-186f, therefore, is a big milestone in the field of planet hunting. It is the fifth and outermost world of the planetary system around red dwarf star Kepler-186 and is almost certainly a rocky planet. The find is significant because it is the first Earth-sized world we’ve found in the habitable zone of a star. Habitable zones, also known as ‘Goldilocks zones’, are regions around a star where the temperature is just right for water to form. Earth, for example, sits almost bang in the middle of our sun’s habitable zone. Although previously we have found exoplanets (worlds outside the solar system) in these zones, none have been the same size as Earth. As our planet is known to have life, it stands to reason that a similar planet may also be habitable. 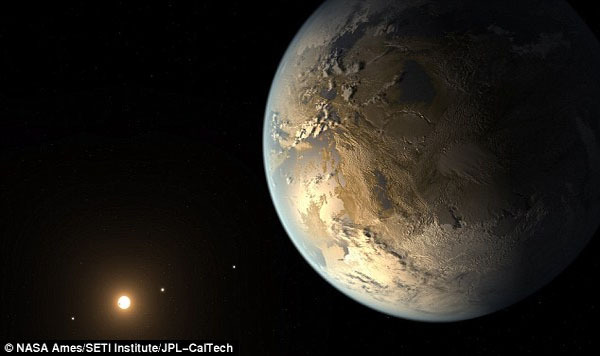 This could make Kepler-186f the first world we’ve found that might host life as we know it. WHAT IS A GOLDILOCKS ZONE? The Goldilocks zone, or habitable zone, is the belt around a star where temperatures are ideal for liquid water to pool on a planet’s surface. To determine the location of a star’s habitable zone, scientists have to first learn how much total radiation it emits. They can calculate this by knowing the size and type of the star. They can then estimate a region where it might not be too hot or too cold for water to form. ‘Taking our planet as an example, water is pretty important for life,’ Dr Steve Howell, one of the lead authors on the study that found Kepler-186f and a scientist on the Kepler mission, tells MailOnline. This makes the discovery of a planet that could have water all the more important. The planet orbits an M-type dwarf star, one that is slightly dimmer than our own sun, making its habitable zone hug it slightly tighter. But Kepler-186f is on a slightly different orbit than Earth, taking 130 days to make it around the star. This places it towards the edge of the habitable zone of Kepler-186. The other four planets in the system have orbits lasting three to 21 days, making them inhospitable. 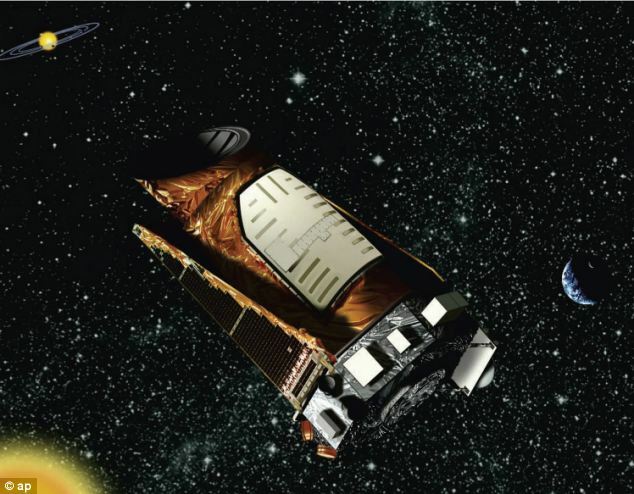 The Kepler space observatory, named after the 17th century German astronomer Johannes Kepler, was launched on 7 March 2009 to scan a portion of the Milky Way for Earth-size planets that could harbour life. The research team use data from Nasa’s Kepler space telescope, which simultaneously and continuously measured the brightness of more than 150,000 stars every 30 minutes. When a planet candidate transits, or passes, in front of the star from the spacecraft’s vantage point, a percentage of light from the star is blocked. This causes a dip in the brightness of the starlight that reveals the transiting planet’s size relative to its star. Once three transits have been observed, a planet can be confirmed to exist around the star. To measure the planet’s size accurately, the size of the star must be known. 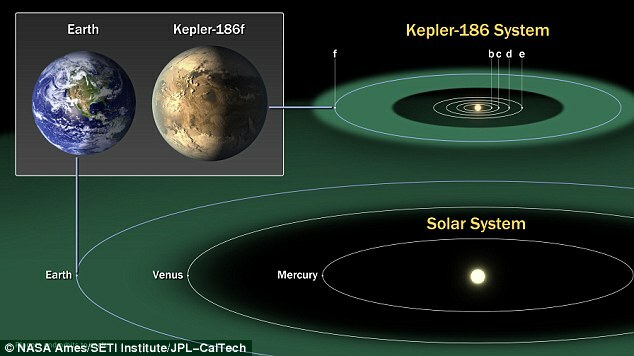 ‘Kepler-186f is at the right distance from the star for water to form,’ Thomas Barclay, a research scientist on the Kepler mission and another author on the paper announcing the discovery of the planet, tells MailOnline. Barclay was involved in modelling the planet and discerning what we think it could look like, as shown in the artist’s impressions. ‘We looked at the kind of light coming from the star, which is slightly redder than our sun,’ he explains. ‘So we tried to cover the planet in the right colour light, so the planet looks slightly more orangey. ‘We tried to work out what sort of colour the ocean would be, so with less blue light the oceans would be duller, not a bright blue like our own planet. ‘Then we have the clouds and ice, which are very reasonable assumptions to exist if there’s an atmosphere. ‘These would reflect the same colour as the star – our clouds are white because the sun is white. A Sudden Multiplication of Planets – Kepler finds 715 of them! 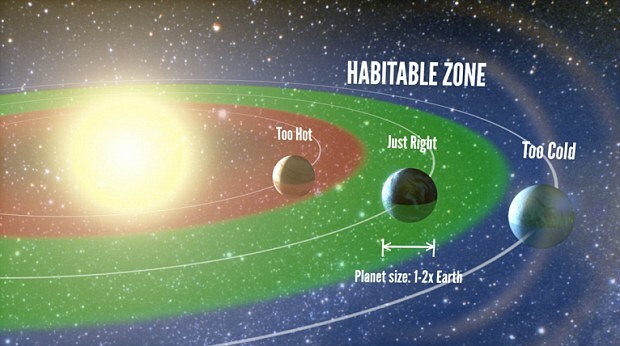 While it’s known the planet is in the habitable zone, astronomers can’t be sure with absolute certainty it has water. Extrapolating on what we know from Earth, however, Kepler-186f is a prime candidate for being a world with oceans and seas. That would be dependent on it having an atmosphere, though. ‘If we didn’t have an atmosphere, we wouldn’t have liquid water,’ says Barclay. ‘It blankets us and traps heat. The Kepler space telescope orbits the Sun 40 million miles (65 million kilometres) from Earth. It is named after 17th Century astronomer Johannes Kepler. It was launched in 2009 with the sole purpose of finding new stars and planets. To date hundreds of planets have been confirmed with the telescope. But there is still a lot of data to look through which could have more planets within it. The telescope recently lost the functionality in two of its four ‘reaction wheels’ that are used to point it at stars. This has left it lying adrift in space, but Nasa has plans to re-purpose it for a new mission. And if there is plant life on this planet, Barclay says it would again be different to what we have on Earth. ‘We did think about what colour the plant life might be due to photosynthesis. ‘The best guess is they would be more yellow, due to the different colour of the star. Both Barclay and Howell say that this world is probably more like a cousin to Earth than a direct twin. It has similar characteristics but it orbits a different star. With upcoming telescopes like Nasa’s James Webb Space Telescope, launching in 2018, we might be able to observe the atmospheres of planets like these closer to us and find out if they have similar chemical compositions to our own. This would definitively give us answers as to how habitable other worlds are. 70 per cent of all stars are so-called M-type stars, the same as the one Kepler-186f orbits. This means that a lot of planets we find might also be in orbit around these stars. Discovering that Earth-sized worlds can exist in the habitable zone around these stars, therefore, is of huge importance. ‘There could be many of these planets closer by,’ explains Dr Howell. ‘If we can find those and subject them to study, we could see if they have biosignatures in the atmosphere. ‘In the next 20 years I’d say there’s an 80 per cent chance we’ll find a definite habitable planet in our vicinity. And there are still many planets lurking in the data collected by the Kepler space telescope. The announcement of Kepler-186f is just a tantalising hint at the number of habitable worlds that could be awaiting our discovery. 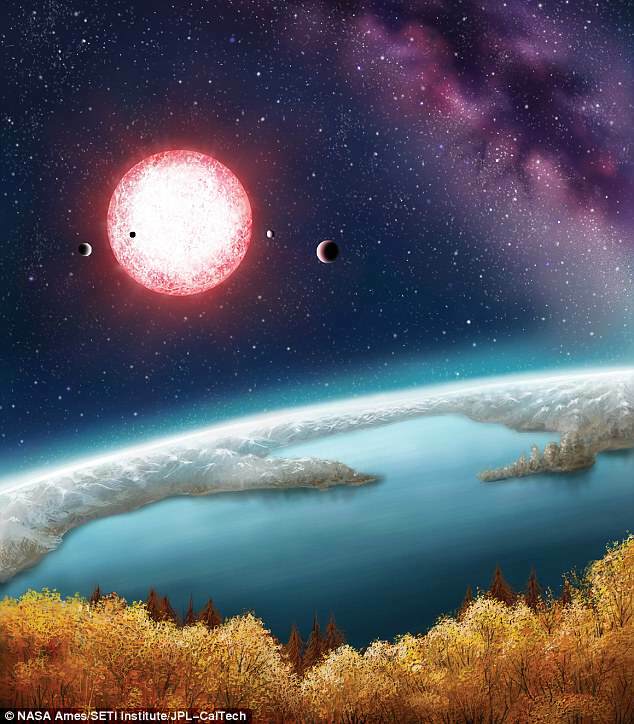 ‘One of the steps along the road to answering “Are we alone?” is finding worlds such as Kepler-186f that look like the one planet that we know is inhabited,’ Barclay concludes. Never Give Up! Prey Eats Its Way Out of Predator! Remember we still have fools who believe the Earth is only 6000 years old.